Szmara exemplifies a segment of the local economy driven by emerging entrepreneurs – small-business owners who dream of making a big impact well beyond the Mahoning Valley. The challenges confronting these early-stage companies are daunting, especially if they have limited access to capital. In Szmara’s case, she’s an entrepreneur who seeks certification as a minority business enterprise that employs advanced manufacturing technology – a perfect fit for what is underway at the Youngstown Business Incubator. As the YBI further embraces additive manufacturing with the recent opening of its Tech Block Building No. 5 – a building dedicated to housing 3-D printing companies – it is also diversifying its resources to include initiatives such as the Ohio Minority Business Assistance Center, or MBAC. Pamton 3D, which owns three Stratasys printers, uses additive manufacturing to produce prototypes for the dental industry, the pet industry and the automotive business, Szmara says. This year, the company plans to work with the MBAC to help it enhance its business model. “We’re even at the beginning phases of fabricating prosthetics for ducks born without feet,” she says. Certification as a minority business enterprise would enable the company to better compete for public contracts, Szmara says. “As we start to grow, we can expand our market through offering more services with different materials,” she says, noting her company has started to work with ceramic printing. This coincides with the arrival of a 3-D metal and ceramic printer – the Carmel 1400 system – in YBI’s new additive manufacturing complex, the only 3-D printer of its kind in the United States. “It’s just nice to be included on the playground,” Szmara says. 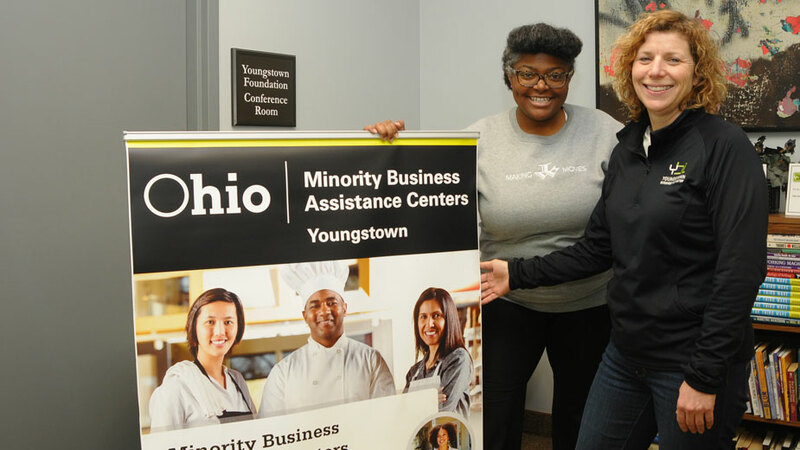 YBI’s Carmella Williams and Barb Ewing are enthusiastic about the Minority Business Assistance Center’s prospects for 2018. In an effort to increase diversity in the small-business economy, Ohio has accelerated its push to develop minority entrepreneurship programs across the state. A central component is the Minority Business Assistance Center. Effective Jan. 2, the MBAC is being managed at the YBI. “The state is extremely excited about this partnership because of the resources that YBI brings to the table,” says the program director, Carmella Williams. The Greater Warren-Youngstown Urban League initially managed the MBAC, but a lack of resources prevented that organization from renewing its application for 2018. This opened the opportunity to integrate the organization into the YBI, underscoring its expanding role as a facilitator of new entrepreneurship initiatives, Ewing says. These initiatives, she continues, complement the YBI’s traditional mission as an incubator and accelerator intended to foster the growth of young high-tech companies. Last year, for example, the YBI launched its Women’s Entrepreneurship, or WE, program, an effort to help women bring their business ideas to execution. “They heard about the WE program,” Ewing says of the state. Since the community wasn’t in this year’s application, Ewing says the state thought the YBI would be a logical fit to administer the MBAC. Among the primary goals of the MBAC is providing advocacy services to minority-owned businesses – both startups and established companies – so they could eventually be certified through the state of Ohio. Certification of such businesses could help them improve their ability to bid should they seek to secure federal or state contracts. To guide this process, the MBAC has designed three courses designed to help minority-owned businesses, Williams says. Second stage is the “Launch” component – a nine-week course designed to guide entrepreneurs on how to bring a business or product to market, Williams says. “It’s also about how to go about bidding on small contracts and how to gain access to government contracts,” she says. Moreover, it’s during this stage that the program shows the entrepreneur how to navigate the financial weeds such as performing market and cash flow analyses, and shore up its business model to obtain capital. The final piece is the “Grow” program, a four-week course that helps going concerns strengthen their business and marketing strategies. “It’s for those who may still need some guidance,” Williams says. Ewing acknowledges that every business is different, so what is suitable for one entrepreneur might not work for another. “We’re also taking a customized approach to this through individual counseling and classes to find an approach or path that provides the best fit for them,” she says. Ewing adds that the MBAC’s partnership with the YBI benefits the program in several ways. First, it allows the YBI to embark on external fundraising directed to help the initiative. “It’s principally funded by the state with a small grant,” which she says isn’t sufficient for the program YBI wished to build. “We’re planning to do some additional fundraising above and beyond any matching funds,” she says. Applications for the programs are being accepted through the month, and courses should begin in February. The MBAC administered by the YBI covers the entire eastern corridor of Ohio, from Ashtabula County to the north to Monroe County to the south. Obtaining certification as a minority-owned enterprise helps give a company or firm the credibility it needs to grow, even if the business doesn’t intend to pursue contracts with the federal or state governments. 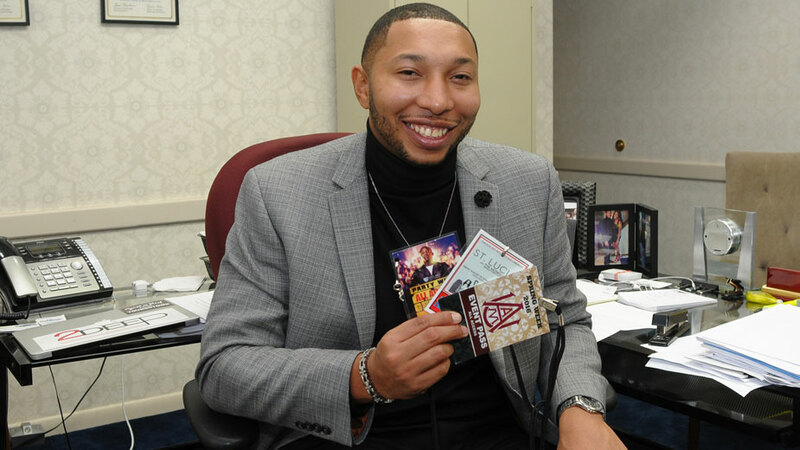 “It tells your clients that you’re credible,” says Terrill Vidale, president of 2Deep Entertainment, based in Youngstown. Terrill Vidale says certification as a minority business gives his company credibility. His company is an entertainment agency that provides production and talent management for a variety of shows across the country. The program provided Vidale with information on how to obtain equipment loans, how to use collateral, and gave him the confidence to overcome hurdles in the business world. He says it took roughly 2½ months to complete the program and achieve state credentials. Over the last four years, Vidale has produced shows across the country, especially in the college circuit. Vidale has taken 2Deep Entertainment to 16 states, where it’s helped to produce shows that feature artists in a variety of genres – hip-hop, jazz, country and pop. And, Vidale started the Gospel Fest as part of the Summer Festival of the Arts held in Youngstown. “We’re working on a headliner for 2018,” he says of this year’s Gospel Fest. But 2Deep Entertainment’s state certification doesn’t guarantee it any contract. Indeed, those businesses that are credentialed as minorities will find that it’s still intensely competitive. “The state has done a better job in expanding opportunities for minorities,” says Mark Herron, president of Herron Office Products in Warren. His company is mostly a web-based office products service that supplies individual and commercial customers with everything from paper clips to office furniture. “I did some business with the Pentagon a few years ago,” he says. One of the biggest hurdles facing minority-owned companies, Herron says, is acquiring the capital necessary to continue funding their business operations. “I know the challenges minority-owned businesses face,” he remarks. While the state of Ohio and the federal government have programs in place designed to encourage minority-owned businesses to bid on the contracts they let, local governments have failed to follow suit, Herron says. For example, Herron says, inner city school systems such as Warren or Youngstown should do more business with minority vendors because the overwhelming majority of their students are black or Hispanic. “They should start reflecting through their vendors the diversity of folks that they serve,” he notes. This, Herron continues, would lay the foundation for future minority entrepreneurs who see a brighter future and a growing customer base in the region.